The city of Trois-Rivieres has been hosting car races since 1967. The current, 1.521-mile eleven-turn layout was first used in 1994. American Le Mans teams would compete for 2-hours and 45-minutes on this very tight circuit. The field heads for Ryan corner on the pace lap. It is an all Audi R8 front row with the No. 1 Team Joest entry driven by Frank Biela and Marco Werner on the pole. 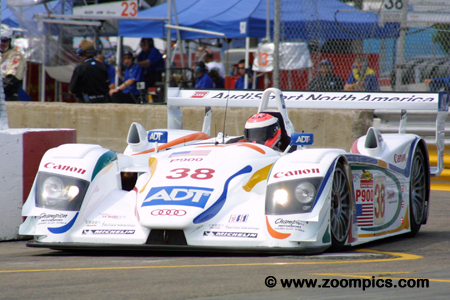 Second fastest was the ADT Champion Racing Audi shared by J.J. Lehto and Johnny Herbert. A total of thirty-cars took the Starter’s flag but only twenty competitors were running at the finish. A win at Sonoma broke a tie in the LMP900 class standings and gave the lead to Team Joest drivers, Frank Biela and Marco Werner. The qualifying duties were performed by Werner and he earned his first pole position – setting a new lap record in the process. 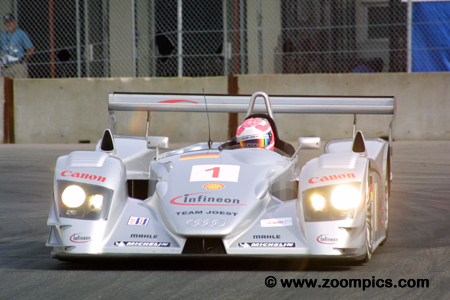 Early in the race, the Joest Audi was chased by the Champion entry. An early stop by their competition allowed Biela and Werner to gain a lap and take an easy victory. Duncan Dayton had an accident in the previous round at Sonoma that severely damaged the Intersport Lola EX257. 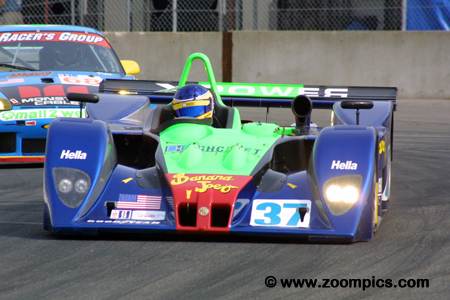 Dayton and his teammate, Jon Field were leading the LMP675 points chase before the incident at Sonoma. With little time for repairs before Trois-Rivieres, the team leased a car from Chamberlain Motorsports in England. Their decision paid off as Field and Dayton finished ten overall and first in class. 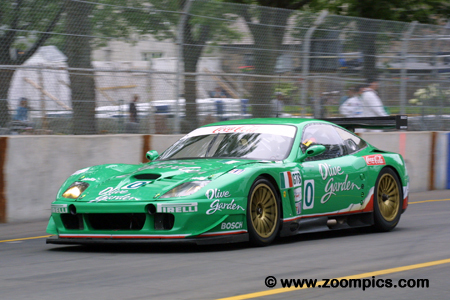 The Team Olive Garden Ferrari 550 Maranello was at a distinct disadvantage at Trois-Rivieres. Their main rivals, Corvette Racing, had their car fitted with traction which is important for the tight and twisty Trois-Rivieres layout. Ferrari did not have this technology on the 550 Maranello. Despite this disadvantage, the drivers, Emanuele Naspetti and Mimmo Schiattarella were able to finish third in GTS. The J3 Racing team showed great potential at Road Atlanta. Drivers, Justin Jackson and David Murry finished fourth in GT. At Trois-Rivieres, the No. 79 Porsche GT3RS qualified ninth in class and twenty-second overall. As the result of an excellent race strategy and the misfortune of some their competitors, they finished third. However, they were disqualified due to a problem with the bumper brackets but were reinstated later. 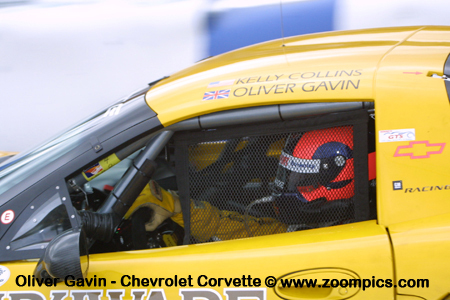 Entering round four, Oliver Gavin and Kelly Collins trailed their Corvette Racing teammates Ron Fellows and Johnny O’Connell by just four points. 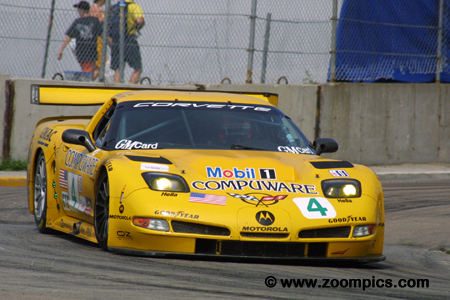 At Trois-Rivieres, their Chevrolet Corvette C5-R started second in the GTS class behind one of the Prodrive Ferraris. 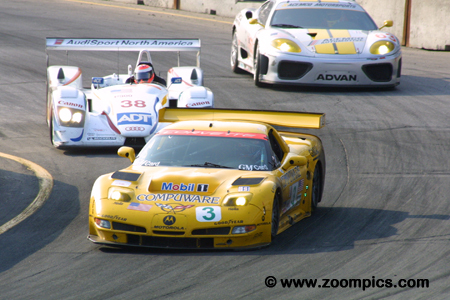 The pair chased the Fellows/O’Connell Corvette for much of the race. A quick pit-stop allowed Gavin and Collins to take the lead and score their second win of the year. 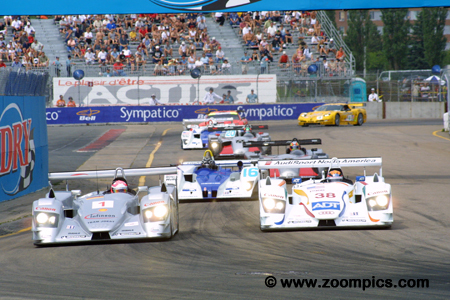 Heading into the Trois-Rivieres event, J.J. Lehto and Johnny Herbert were second in the LMP900 standings. The ADT Champion Racing Audi R8 they shared would start on the outside of the front row. The pair chased the first place No. 1 Audi R8 of Frank Biela and Macro Werner but a poorly timed pit-stop caused them to lose a lap to the leaders. They were never able to get their lap back and challenge for the victory. 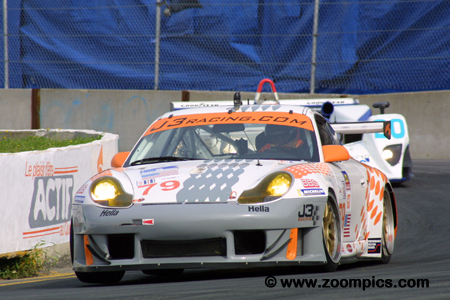 The Alex Job prepared Porsche GT3RSs were dominating the season. They won the first three races of 2003 and had one-two finishes at Atlanta and Sonoma. Leading the GT point standings were Sascha Maassen and Lucas Luhr in the No. 23 Porsche – the pair accounted for two of the team’s victories. 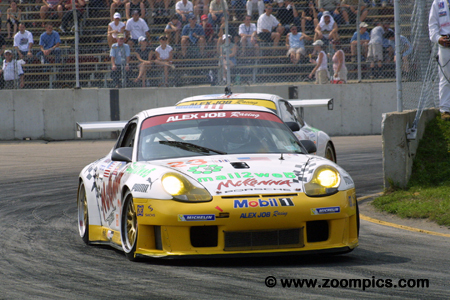 Maassen put the Porsche on the pole and set a new lap record in the process – they won their class by three-laps. An accident at Sonoma prevented the LMP675 point’s leader, Intersport Racing, from starting the race. As a result, a class and overall victory by Dyson Racing at Infineon allowed them to take the lead in the title chase. The No. 16 Lola EX257 was driven by James Weaver and Butch Leitzinger. Leitzinger qualified the car and put it on the class pole. But their race lasted only six-three laps before they retired with an electrical issue. 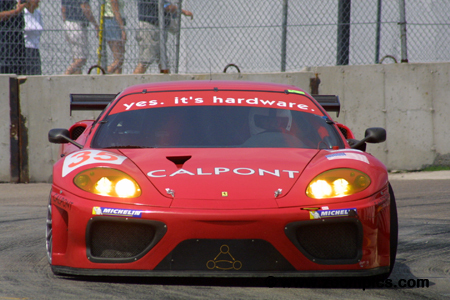 The GTS point’s leaders, Ron Fellows and Johnny O’Connell won the previous round at Sonoma. The Canadian, Fellows was looking to repeat this performance on his home soil. During the race, Fellows and O’Connell were able to move into first and led much of the event. However, a poor pit-stop allowed the Corvette of Gavin and Collins to take the lead. Unable to pass their teammates Fellows and O’Connell settled for second. The No. 35 Risi Competizione Ferrari 360 Modena failed to finish the first two races of the season- Sebring and Road Atlanta. Things turned around for drivers, Terry Borcheller and Ralf Kelleners at Infineon Raceway when they finished third in GT. At Trois-Rivieres, Borcheller was replaced by Anthony Lazzaro. The team’s good fortune continued - the pair started fifth in class and were in second place at the checkered flag. 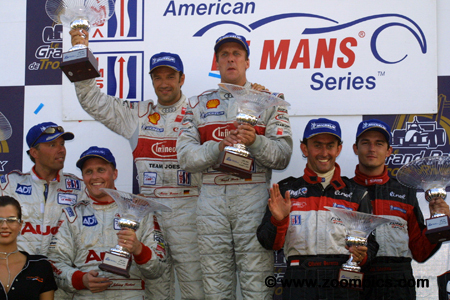 The LMP900 podium for round four of the 2003 American Le Mans Series. On the left side of the rostrum are the runner-up’s from ADT Champion Racing, J.J. Lehto and Johnny Herbert. Third place finishers Olivier Beretta and David Saelens are on the right side of the podium. 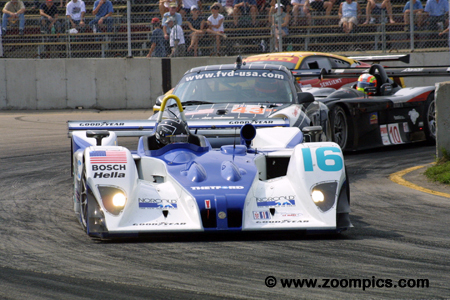 In the middle are LMP900 race winners, Frank Biela and Marco Werner.